It will not be an old wizard who saves the world. It is the role of old wizards to help the younger heroes of these stories to do that job. Merlin schools young King Arthur. Gandalf guides Bilbo & Frodo. Following this tradition I seek to enchant, educate and empower my audiences so that they have the confidence, knowledge and skills to protect our planet. 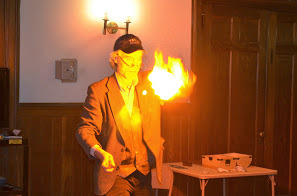 I am offering a number of enviromagic shows this year! MAGITRICITY introduces the basics of energy and climate change. It teaches that everyone has the power to save energy, save money and save the planet. It began as a companion piece to an exhibit on climate change at the Yale Peabody Museum. RECYCLING IS MAGIC RECYCLING IS MAGIC has been my mainstay show for more than 15 years. In a story of monsters, magic & too much trash, a wandering wizard learns that recycling is the best magic to cure the woes of a village beset by messy ogres. LITTLE FAIRIES, BIG MAGIC teaches the importance of humans, animals (and fairies) sharing wilderness. It was created for fairy festivals but succeeds in providing its fun and important message in all settings. RESOURCERY presents environmental magic and environmental learning on a variety of topics in a TED Talk fashion. While Resourcery is usually shared with professionals and other adults as part of training programs and conferences, it can be adapted for younger audiences. and the next, generation of heroes! 2018 began with water magic and ended with energy magic. Water magic was assisted by teachers from America’s Hogwarts, McBride’s Magic & Mystery School. New lessons in energy magic came from people working in the nuts & bolts world of training the next generation of energy experts. Let me explain. WATER WIZARD grew out of my desire to share the magic of our planet’s most precious resource with audiences. With the help of Master Magician Jeff McBride, Dean Larry Hass and others at the real-life school for wizards, I created a show of 25 minutes which empowers audiences to care for our water planet (More on the adventure of learning Vegas-level water magic in a previous post). They learn how to be water wizards, conserving and protecting water whether it is coming from their own tap or traveling into an ocean downstream. In 2019 I will be sharing it with water experts to help my messaging be as powerful and professional as is the magic I learned from Las Vegas. MAGITRICITY began many years ago as a companion piece to an exhibit on climate change hosted by Yale’s Peabody Museum of Natural History. Like Water Wizard, it empowers audiences with basic knowledge about humanity’s relationship with Nature, in this case climate & energy. Through the show, and fliers provided at the end of the show, it offers direction and hope on how to save energy, save money and help save the planet. Near the end of 2018 MAGITRICITY received a noble invitation to take the stage again from Eric Gribin, Director of the Energy Management Program at Tunxis Community College. Working with Megan Dempsey of the Connecticut Science Center, Eric and I provided more than just magic and information about the environment and energy. Eric engaged the young people in energy analysis demonstrations and inspired them to see their future in the clean energy field. What magic does 2019 hold for you? What suggestions have you for Water Magic & Energy Magic in the upcoming year? I would love to hear from you! “Everything is connect” is a fundemental truth I share in Water Wizard, MAGITRICITY and my other enviromagic shows. As a sorcerer I continue the ancient tradition of traveling by magic. According to historic accounts, ancient sorcerers might ride upon hippogriffs, the offspring of the mythical griffin and a mare. Flying brooms and magic carpets were well-known as methods of transport for witches and other wonder workers far before Harry Potter and Disney’s Aladdin. When I need to “feed” my “hippogriff” away from home I make use of the EV charging stations popping up around the nation. As a modern sorcerer of sustainability it is fitting that I travel upon wind and sunlight. In contrast to the wizards of old my transport is of a new sort for a new age: a Nissan Leaf. Fueled by the solar energy generated on our roof, and the grid-based electricity which Connecticut allows us to source from the zero-carbon generators of solar and wind, the Leaf does not pollute or contribute to climate change. This fully electric vehicle may not have the range of a gasoline vehicle or even the gas-electric Prius which I have so enjoyed owning. But then again, I don’t imagine the hippogriffs of ancient sorcerers could fly forever either. As an environmental educator and magician I look forward to April as a Santa Claus performer might look forward to December: a month busy with shows. Weeks before and after Earth Day are fun and full. This year I am delighted to add a number of other magics to the recycling, energy, climate change and other environmental performances I will again be sharing this year. This Saturday March 29th I will be performing “Escape from the Goblins” at the La Grua Center in Stonington, CT. This is a storytelling magic show in which I weave tricks into a tale of a woodcutter who is captured by goblins. Jasper learns magic from his fellow prisoner, an imp, and together they make their escape past goblins, an ogre and the Goblin King himself. I continue to improve this show by gaining feedback from friends in the magic and theater worlds. Eventually it will be part of a longer epic storytelling show, “The Goblin Sword.” Today’s public loves the magic of Harry Potter, Lord of the Rings and other works of film and fiction. Ironically, the love of magic has not extended to magicians and magic shows. I feel this is because magicians too rarely engage their audiences with emotion and story. Rowling and Tolkien enchant us with their characters, plots and beautiful stories. If magicians learn to do the same, adding their “magic” to that of great stories, we may find ourselves in a period of magical renaissance. Earlier this week I shared my “Hard Times Magic” show with residents of a homeless shelter. We shared conversation and food before I shared how magic can help all of us through our tough times. I told some tales of how I am inspired by Harry Houdini (Born on March 24th) and others to continue onward despite life’s challenges. Involving residents as volunteers in parts of the show empowered them and, I hope, keeps them optimistic about their own futures. Magic can play so many roles in our modern world, not just in the tales of bygone days. It can empower and inspire us by capturing our imagination and pushing us to reconsider just how much power each of us has to save our planet and to save ourselves. Asked for advice on how parents could help their children become more intelligent, Albert Einstein offered a delightful bit of advice. His words went something along the lines of “If you want your children to be intelligent, read them fairy tales. If you want them to be more intelligent, read them more fairy tales.” This strikes me as sage advice for parents as well as magicians and environmentalists alike. Stories capture the imagination. Fairy tales and magic spark the imagination and help young and old think outside The Box in which we find our minds imprisoned. I use fairytales of ogres, wizards, goblins and, yes, even fairies, to help tell my environmental stories about recycling, energy and water. I hope that my magic and stories help my audiences increase their own thoughts far beyond The Box.